There’s no other way to say it. It’s not going to wake the neighbors, but others in your apartment/house are going to hear coffee being made. To be honest with you, I’m not sure what wakes me up more, the caffeine in the coffee, or the noise it makes when brewing a cup. […] However, if you like to get up early and have a cup of coffee while your spouse sleeps, the Tassimo might not be for you. Considering that my kitchen is right next to my living room, and has a large opening between the two, I knew that my morning coffee routine was going to scare the bejesus out of her, and that was something I’d like to avoid. I either would have to skip drinking coffee first thing in the morning (NOT the best idea), or I had to find a quieter method of securing my first cup of the morning. As I was formulating plans on what to do about my precious first cup of the day, I remembered a few comments that people had made on my Braun review a few weeks earlier…they mentioned that the newer type of Tassimo machines, specifically the Bosch brand, was much quieter. Realizing that my Braun was about five years old, I decided that I should at least look at the Bosch to see if it was different enough to warrant the expenditure of money. Coincidentally, I just happened to have in my possession a gift card to a store that not only sold the Bosch Tassimo machine, but also had a generous return policy. 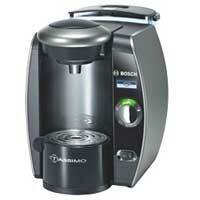 A few days later, a Bosch Tassimo Hot Beverage System machine was purchased, and put through it’s paces. At its heart, it’s the same as the Braun in that you place T DISCs in it, press a button, and excellent coffee, tea, and chocolate beverages come out. Please check out my review of the Braun machine to understand what Tassimo is and how it works. From here, I’m just going to focus on the improvements that the Bosch machine makes over the Braun. It’s faster. When you put a T DISC into the Bosch and hit the brew button, it almost instantaneously starts the brew – there does not seem to be a water warm-up process, yet the beverage that comes out is very hot. From start to finish, it takes under two minutes to brew a cup of coffee. With the Braun, I would put a T DISC in and go to the bathroom while the machine warmed up. This is not needed with the Bosch. I now just put the T DISC in the machine and hit the brew button, and the coffee brews while I get breakfast going. It’s freakin’ quiet!!! During the brewing process, from six inches away, the sound it made never went above 73 dB, which is the same as a household vacuum from ten feet away. I have brewed many cups of coffee with my “roommate” asleep about 12-15 feet away, and she didn’t stir at all. In fact, I think the snap, crackle, and pop from a bowl of Rice Krispies might actually be louder. My original Braun Tassimo machine was a first generation machine. It had the basics of what any Tassimo Hot Beverage System needed, but it didn’t have any of the creature comforts that comes from refining the user experience over time. The Bosch does. First, the unused portion of the power cord can be snaked back inside the machine to keep it out of the way. Second, the power switch is on the front of the machine, and you’re encouraged to turn it off between uses. Third, the water reservoir on the back of the machine has a carrying handle that allows you to easily remove it from the machine and refill it in the sink. Fourth, the machine has a low-water sensor and alert light to let you know to refill the tank so you don’t get half a cup of coffee. Fifth, it has a series of lights that let you know various information about the machine, such as the aforementioned refill alert; when to perform a descale cleaning; when the brew is in automatic stage and when it finishes and switches to the manual stage; etc. Sixth, the model I bought has an LCD display that shows you, in various languages, step-by-step of the brewing process as well as other diagnostic information. These little creature comforts add up to a much better user experience, and make the Bosch a joy to use.